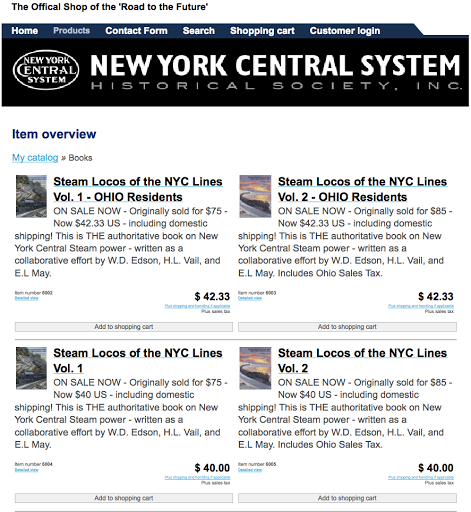 The New York Central System Historical Society just opened its new on-line “Shop to the Future” with books, drawing CD’s, back issues of the Central Headlight magazine, advance reservations on an exclusive HO NYCSHS Pacemaker boxcar, and a new DVD of indexed PDF’s of every Central Headlightmagazine from 1970 through 2011. The shop’s offerings will expand with future editions and improvements. Ordering is very easy using the online features. You can join the store by clicking on the “Customer Login” tab near the top of the home page. NYCSHS members automatically qualify for discounts on certain items, but you have to register for that discount to take effect. Non-NYCSHS members do not have to register, but you may not be able to take advantage of future sale and special offer notices if you don’t register. When you register you will be asked for your name, address, email, and phone number. You should click the “Products” tab (also near the top of the home page) to view the merchandise available in the store. Here you will find a page with several product categories. At this point, all the NYCSHS published books, some of the mechanical drawing CD’s, and a variety of Central Headlight back issues are available. You will also find the DVD of the 1970 – 2011 Central Headlight listed in both the DVD and Headlight sections. Here is a screen shot of part of the “Books” Section. Many of the CD, DVD, model, and Central Headlightback issue prices include shipping, but others do not as explained in the description for each product. Some of our product pricing includes applicable 7.75% Ohio sales taxes for Ohio residents while others do not. Some products include a special discount for NYCSHS members. Each item listed includes explanations about the applicable tax. Some products have a special members’ price listed, while others do not. Many products that are not otherwise specially priced may be purchased by members at a 20% discount. Those items usually include that information in the product description. The discount is given during the checkout process. International customers will be required to work with us to determine shipping costs. 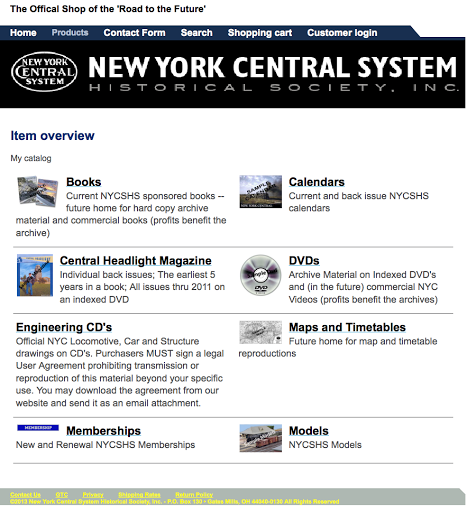 Every CD or Central Headlight back issue found on the NYCSHS.org website is available through this store. We have not listed all of the mechanical drawing CD/DVDs or all of the back issues available. To allow you to buy these items you must use the “generic” drawing CD and Headlight back issue selections. Just order using the generic selection and tell us which specific CD or Headlight back issue(s) you wish to buy in the “comments” section at checkout. The “generic” Central Headlight magazine is priced correctly for any issue. Therefore, if you want to buy three back issues, just order 3 generic issues and identify the issue dates requested in the comments box while checking out. A listing of available back issues is found on the main NYCSHS.org website “Central Headlight” page. Order by quarter/year. There is a similar generic mechanical drawing CD/DVD item, however, due to the variety of these prices, we assigned it a cost of $0.00. We will contact you for payment for the CD/DVD’s you order. You may find a complete listing of available CD/DVD’s on the main NYCSHS website “Books and Drawings” page. Order by the name of the CD/DVD. Final pricing will be handled via email prior to shipping. Once we have your signed copy we will mail you the product you ordered. You only need to sign the agreement for the first copy you buy. All future purchases will be covered by that agreement. You can use most credit cards, your PayPal account, or you can send us a check for your purchase. All credit card transactions are handled by PayPal’s secure server through our store. The NYCSHS will not see your card information. Be aware that PayPal’s checkout process is set up to steer you toward using your PayPal account, or establishing a new one. If you want to use your VISA or MasterCard you need to look for and UNCHECK some boxes that appear during the checkout process. Take your time and things should go flawlessly. Use the “Contact Form” near the top of the shop’s home page to automatically generate an email to the shopkeeper. We will get back to you as quickly as we can. 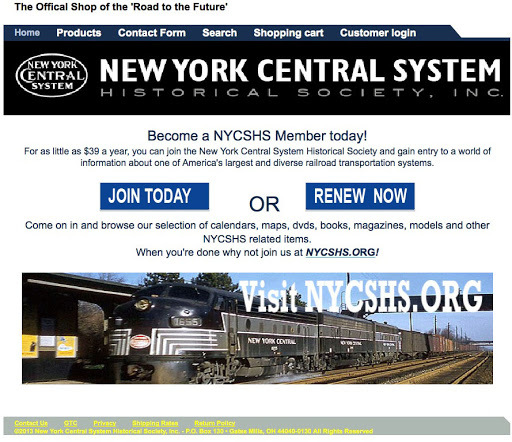 Remember that all the work on the website and the store is done by volunteer NYCSHS members. We hope you enjoy browsing and shopping on-line for our NYCSHS products. Look for many more to be added over the next year as we gain experience with our store. This entry was posted in Members Information, NYCSHS "Collinwood Shop" Your NYCSHS Hobby Store, NYCSHS News. Bookmark the permalink.